I first read I Heard The Owl Call My Name when I was about 14. It was one of those books that one reads far too young to really understand; its beautiful cover perhaps seduced me. At the time I was disappointed: a recent re-reading had a powerful impact. I would agree with the poster here that Mark’s terminal illness is one of those conveniently fictional ones, and that Mark himself is a little bit of a too-good-to-be-true cipher. However, this is a far from sentimental portrait of a remote community. Is it really slight? There are two incidental characters – the atheist teacher and an overbearing anthropologist – who Craven uses to neatly and concisely skewer some of the academic approaches to this kind of First Nations community. The book overall is far from slight – like The Great Gatsby or Heart of Darkness, a brief book with a power far beyond its pages. 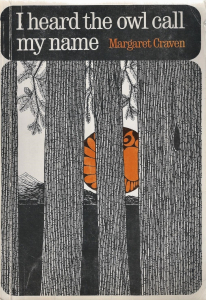 I Heard the Owl Call My Name by Margaret Craven ~ 1967. This edition: Clarke, Irwin & Co., 1977. Softcover. ISBN: 0-7720-0617-2.138 pages. This is a slight, quiet, non-sentimental though rather romanticized novel about a young, terminally ill Anglican priest and his short residence in the Tsawataineuk (First Nations) village at the head of remote Kingcome inlet, on the southwestern British Columbia coast, opposite the northern tip of Vancouver Island. The time frame is contemporary with its writing, in the mid 1960s.